Located in the center of the north and south coast line of China, Shanghai is the biggest port city in China and the third largest port in the world. the steamers there are connected with more than 400 ports in the world. because of the speed, the steamer business is not quite brilliant with only some of them running like the steamer to dalian, shen yang at the interval of 4 days from the fair road dock while the other long distance shipping along the coastline have been stopped. there are scheduled steamers to near places like Nan Tong, Ding Hai and Pu Tuo at sixteenth pu wharf. if you want to go to Zhou Shan Islands, you should first take a bus at sixteenth pu and to Lu Chao Port or Gold Mountain Port to board a steamer. travelers going to Chang Xing Island and Hengsha Island should board the steamer at Wusong dock. make the boarding place clear before going to Chong Ming Island. Besides, travelers who want to inchon and pusan in Korea or Osaka and Kobe in Japan would board the interdomestic steamer at the out rainbow wharf. Wusongkou is situated in the northern part of Shanghai, at the confluence of Huangpu River and Yangtze River, the original is the mouth of the Wusong River, known as Wusongkou. Wu Songkou today is become the mouth of the Huangpu River, actually we should call it “Huangpukou”, but the official name never changed, it seems to tell people of this old history. Shanghai International Cruise Terminal (also known as the "one drop dock"). East start from Gao Yang Road, and West to the Hongkou Port, North to Dongdaming Road, , and South to Huangpu River. It covers an area of 150,000 square meters, the total construction area of 410,000 square meters; it is made up of 13 single buildings. The whole project includes reconstruction of 850 m long of Shoreline Avenue, the new international passengers’ terminal building as well as builds the Riverside green and opening space of 80,000 square meters. The transportation Center have a 181,000-square meters super large underground space, allow more than 1000 cars parking at the same time, it will meets the demand of 3-luxury cruise ships boarding , and the center equipped with 24 hours of piloting, tug boat and repair services. Shanghai international Cruise Terminal with a total investment of 260 million dollars, there are 3 docks for 70,000-80,000-tons of large cruise ships boarding. Two years ago, Shanghai officially joined as one of the international cruise ship port cities, Shanghai people are so familiar with is what created this history- Aileen Gina Ship, after that the world three major cruise ship companies of Carnival Cruises, Royal Caribbean cruises, Star Cruises are set up their chain offices in Shanghai. 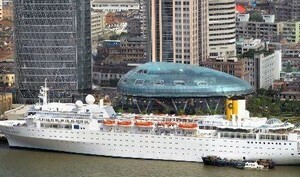 Legend of Seas currently is biggest cruise ship; Shanghai is its base for departure port. Displacement of up to 70,000 tons, set up with 11 decks, nearly 960 rooms, has a capacity of 2,074 tourists. This cruise ship is like a sea-cruising luxury hotels, has all kinds of facilities as restaurants, shopping center and entertainment facilities. Baoyang Cruise Terminal is situated at No.18 Baoyang Road, it is own by Shanghai Aton shares company as well as a member of one of the seven main port in Shanghai. 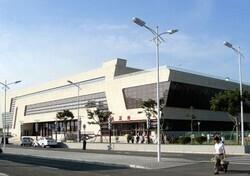 The passenger building was established in 1994, and has 68 stuff work for this company, the total area covering with 23,000 square meters and the terminal facilities has 2 steel mass, and one passengers ferry dock, the water level is 5 m in depth, 150 m of line length, on the land has ship waiting room, ticket office, car parking lot, hotel, supermarket, and supporting service facilities, public bus No.51, Anbei shuttle bus, and tourism Line No 5 are directly to down town from Baoyang Cruise Terminal. In recent years, there are nine high-speed vessels, two passenger ship, three passenger’s ferries operating in Boyang Terminal, and 48 boats departure from here a day. 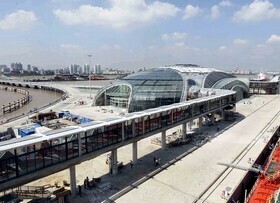 Baoyang ferry terminal has passengers’ capacity of 5,400 people a day; and set up 140 car parking space, it divided into personal vehicles area, bus parking, taxi waiting area, and waiting for transit vehicles parking, on the other side, 2 new high speed ship dock and 2 approach bridge are recently build up here. Waigaoqiao Terminal has a coastline of 900 m long with three containers vessels piers, allow the forth and fifth generation of container vessels boarding. The land area has total of 500,000 square meters, including containers yard area of 238,000 square meters, flat box up to 6,200. this terminal has totally building up nine containers land bridge on every 100 meters. There are12 prestigious international container shipping companies Including United States President Shipping, United Kingdom rail Navigation Java, France CMA CGM, and Japan packet of NYK are has opened 16 international container shipping routes. At the same time, Waigaoqiao terminals also have more than 10 chain routes in the Yangtze River and along the coast line. The throughput of this pier is up to 1.789 million containers a year. Luchaogang Cruise Terminal is located in Luchao Town, Nanhui District, which is in the further south of Shanghai. It is established in 1995, reputed as the important portal of South-East Sea.But with the development of Lingang New Town, and the limitation of water level, energy levels, tonnage, the original car and passenger ferry terminal has unable to meet its development needs. 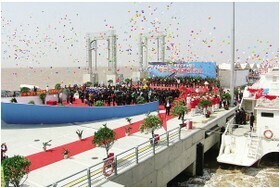 The new built of Luchaogang ferry boat terminal of car and passenger’s ferry piers in the 180 meters next to the old port, available for 5,000-tons car and ferry boat parking. The new terminal plan to build up to 190 meters long and 30 meters wide, and the other side has an approaching bridge with more than 900 meters stretch of four-lane approach extending to the sea. The completion of the new terminal will greatly enhance the transport capacities, effectively release the traffic from Nanhui to Chengsi, and Zhoushan island. keeping a great develop of Nanhui modern harbor city construction. 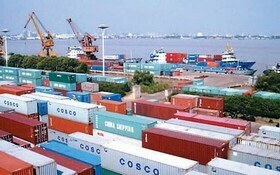 At the same time, Luchaogang terminal will become an important connection bridge between Shanghai ports.